Ayyam Gallery is pleased to announce the addition of Fathallah Zamroud to its roster of artists. Zamroud is a seasoned painter who has built an impressive portfolio in recent years, steadily gaining recognition in his native Lebanon. The Syrian-Lebanese artist was featured in Material Remains, a two-person show with sculptor and painter Ginane Makki Bacho at Ayyam Gallery Beirut in 2014. His work is currently featured in the 13th edition of the Sharjah Biennial. In partnering with Ayyam Gallery, Zamroud will join a robust stable of artists that includes some of the foremost painters in the Middle East and North Africa. 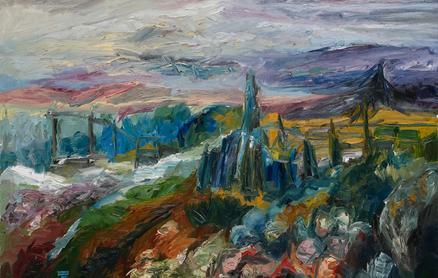 His paintings and drawings will expand the gallery’s programme by representing an updated approach to the distinct tradition of expressionist painting that has developed in Lebanon over the last sixty years. Zamroud’s work carries this legacy into the twenty-first century with an architect’s eye—a critical perception of space that he applies to the shifting cities and emerging communities of an era defined by environmental decline and mass migration. Fathallah Zamroud’s approach to painting is distinguished by expressionist brushstrokes and explorations of colour as an emotive device. A central concept of his compositions is how time defines space, as he depicts refugee camps and war-torn environments with an emphasis on the physical presence of structures in landscapes that are consumed by rapid decline. Zamroud’s latest paintings and works on paper are based on a growing archive of media images and photographs that he assembled as he watched the Syrian War unfold from his home in Beirut. Recently, the Syrian-Lebanese artist has added scenes from other parts of the region transformed by large-scale violence, and continues to find new ways to describe the catastrophic level of destruction that has led to widespread desperation and chaos. Born in Beirut in 1968, Zamroud graduated from the Lebanese American University with a degree in Interior Architecture. While pursuing this degree, he also studied fine arts, and later continued his training at the atelier of painter Louna Maalouf, where he acquired various formal techniques and experimented with a wide range of drawing and painting media. In addition to his artistic practice, he is active in the regional art scene as a board member of Massyr, a non-profit organization that supports emerging talent.